In an ideal world there is no way that a club would be considering selling one of their best players after just one year of service with them. 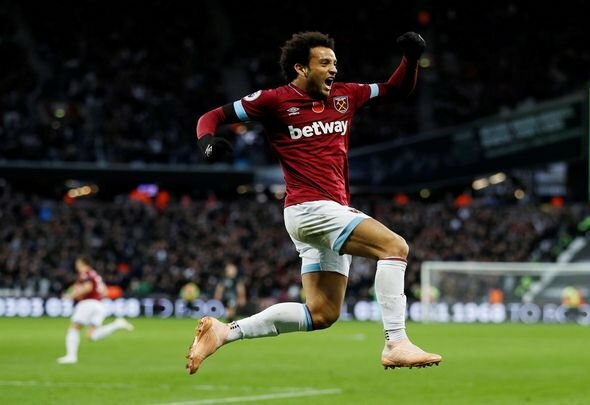 However, in the case of West Ham United and Felipe Anderson, the Hammers would be crazy not to take advantage of Real Madrid’s reported interest in the 25-year-old. Sky Sports claimed on Thursday that the Brazil international is Madrid’s back up plan if they fail with their high profile pursuit of Chelsea winger Eden Hazard this summer. A £65million bid for Anderson would likely be forthcoming should the European champions miss out on the Blues star. That is crazy money for someone like Anderson. The former Lazio man is a fine player and he’s had a decent debut season in England, but he’s not a world class talent at this stage. He enjoyed a tremendous first few months with West Ham, but has gone off the boil a bit since the turn of the year. His form in recent months has been inconsistent at best and anonymous at worst. Yet this is a man that the biggest club in the world is seemingly willing to spend £65million on? That doesn’t sound like such a bad deal for the Hammers, does it? This isn’t a case of a generational talent who is nigh on irreplaceable leaving your football club. This isn’t Manchester United selling Cristiano Ronaldo or Tottenham Hotspur being forced to move on from Gareth Bale. No, this is a team willing to massively overspend on a good but not great player. In that case, Manuel Pellegrini’s side should take the money and run if they do receive a bid of this amount for Anderson. They would have effectively doubled their money just one year after signing him and would surely be laughing all the way to the bank as a result. This might be an unpopular opinion with the Hammers faithful, but this is the sort of deal that is too good to pass up. Pellegrini could use the Anderson money to continue fine-tuning his squad. What’s not to like?